Here's your review of "The Matrix Reloaded" in a nutshell: One incredibly cool, gravity-defying, CGI-aided, swirling-camera kung-fu melee; one jaw-dropping, 100-mph, against-traffic freeway chase; and way, way too much long-winded, expository, circular, self-important, pseudo-philosophical yappity-yappity-yap. Writing-directing brothers Larry and Andy Wachowski saddle their cast with endless equivocal prattle while toiling to buttress the complex plot and metaphysical undertone of this picture's uber-stylish 1999 predecessor, which saw what we think is the real world exposed as an elaborate virtual reality prison for the minds of all humanity. Mankind's suspended bodies provide a power source for a race of machines, which a small band of escapees are hoping to destroy in the post-apocalyptic world outside the Matrix. 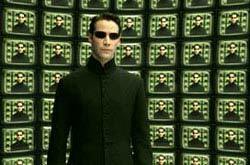 "We can never see past the choices we don't understand," sage but elusive cyber-prophet The Oracle (Gloria Foster) preaches cryptically to Neo (Keanu Reeves), the cyber-Messianic hero whose realization that physical laws don't apply in the Matrix led to the first film's groundbreaking wire-work martial arts fights and bullet-dodging slow-mo stunts.